This work was partially sponsored by the Union of Concerned Scientists, Sustainable Resources Center (Minneapolis, Minnesota), and Independent Energy Magazine. Opinions expressed are those of the author. While the following report on a Trip to Northern Europe in 1996 is more than a decade old, much of the information remains relevant. Wind turbines are bigger and more costly today than those mentioned here, but the principles of community ownership and the attitudes of the proponents are same as they were then. The observations are based in large part on interviews conducted in English with native speakers of Dutch, German, and Danish. It is always difficult to translate from one language to another not only because of differences in the languages, but also because of differences in cultural, political, and legal systems. These differences are readily apparent to a traveler in a foreign country, but are not always so discernible when reading an account in your native tongue while sitting in your office in your native land. Nor is it always so apparent when listening to a foreign speaker of English whose proficiency in English may lull the listener into a false sense of security that the non-native speaker has a 100% grasp of American English and its context. Additional information has been gleaned from documents written in Dutch, German, and Danish. I am not conversant in these languages (to say the least). Thus, I may have missed some crucial nuance that would change or modify my interpretation. All three countries are parliamentary democracies. This is a significant political difference with the United States. Small political parties in these three countries, especially green parties, can exert a greater influence on the political process than can their counterparts in the United States. Further, Germany has a strong federal system much like our system of states, upon which the Germany Federal Republic is based. Distributed Wind Development as used in the United States often refers to Community-Owned wind turbines in Europe. These wind turbines are owned by individuals, farmers, small groups, and cooperatives of nearby residents. This contrasts with the corporate-ownership of large wind power plants as seen in North America. Only in Spain and France are the corporate-ownership of wind plants the norm. The value of wind-generated electricity in each society is about $0.10/kWh. Society and the political culture generally believe in the need for clean, renewable sources of energy and are generally supportive of wind energy in particular. Members of each society, in general, expect their governments to take action in their interest, and trust that they will do so. Members of each society, in general, trust that their governments will not renege on its agreements with investors in wind energy. None of these conditions existed in the United States in 1996, and still do not exist today. There are 2,100 wind cooperatives in Denmark. Nielsen manages sales to cooperatives and individuals in Denmark and Sweden. Revenues from a cooperative investment in Denmark are tax exempt. With a tax rate of about 50%, this is an extremely attractive incentive and is the driving force for cooperative investments. For example, tax-exempt income is worth twice as much as taxable income for someone paying 50% of their income in taxes. Nielsen explains that while altruism was the principal motivator for building cooperatives in the early years, this is no longer the case. (1) These are now tax-driven investments. In Denmark revenue from a family's investment in a wind turbine cooperative is tax exempt if the wind turbines are located within their own commune or an adjoining commune. (2) Revenues are tax exempt if the investment is less than their own electricity consumption plus 50%. For a typical Danish household consuming 6,000 kWh/yr, they can buy shares equivalent to 9,000 kWh/yr. The amount varies with household and the local utility must certify the households consumption each year. Thus, households with electric heat consume more and can invest in more shares of a cooperative wind turbine. The objective of the Folketing, or Danish parliament, in providing the tax exemption was to encourage individual action toward meeting Danish energy and environmental policy. Through this program nearly any Danish household can effectively generate all their own electricity with wind energy. Though support for wind energy and support of individual access to wind energy is not universal in the Folketing, there is an influential green coalition of several political parties. This green coalition has held a controlling influence in the Folketing for more than 15 years and during this period has consistently supported wind energy. Under current regulations households may invest more than their own consumption plus 50%. However, revenues from any amount over this limit are taxed. When a family buys shares in a cooperative they sign a contract permitting the cooperative and the utility to investigate their consumption records. Year to year variations of up 10% above the limit for tax exemption is permitted. Consumption is averaged over several years so as not to penalize a household that conserves energy during a warm but windy winter and exceeds their tax-exempt production. The restriction of tax-exempt shares to those in a household's own or neighboring commune has caused hardships and limited overall investment. Shares must be sold when people relocate outside the permitted zone or the shares lose their tax-exempt status. Because potential buyers of the shares are limited by this same restriction, there is a limited market for the shares and there have been complaints that investors have had to sell shares at less than their face value. There are several forms of incorporation in Denmark. Limited liability companies or a society of anonymous investors, A/S, are the most common. Cooperatives use the form of an interest society, I/S, where the shareholders are liable for the cooperative's debts. The revenue from a wind turbine owned outright, by a farmer for example, is not tax exempt. The farmer or other individual owner can depreciate the turbine at 30% per year. When investors in a cooperative lose their tax-exempt status, they too can begin depreciating their investment. This compensates somewhat for the loss of the tax exemption. Until the year 2000, the utility paid the cooperative for the cooperative's generation. The payment included 85% of the retail price, a payment equivalent to 50% of the electricity tax paid by the consumer on their domestic consumption, and the carbon dioxide tax paid by the consumer on their domestic consumption. (3) This system was modified in 1999. In evaluating the economics of a cooperative wind investment analysts in the past have looked only at the sum of these payments. However, the consumer has paid the electricity tax and the carbon dioxide tax on their domestic consumption. It appears that they are only getting these taxes returned to them. Thus, this is not true income to the consumer even though it appears as revenue on the balance sheet of the cooperative. 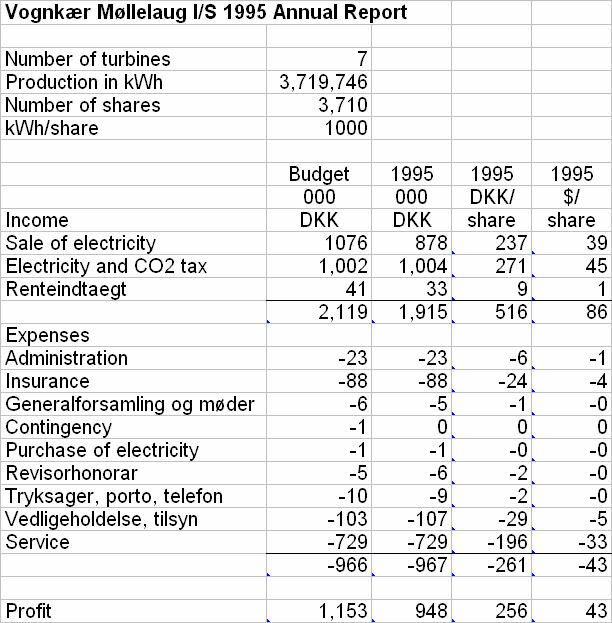 If this observation is valid, only the 0.30 DKK/kWh ($0.05/kWh) is true revenue to the tax-exempt shareholder. 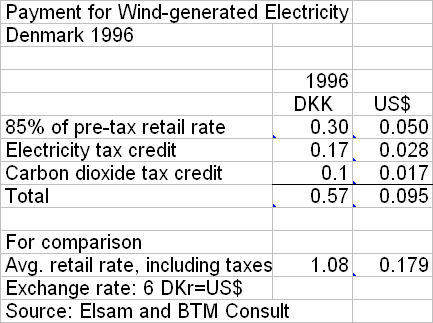 The value of this tax-exempt revenue to a typical Danish taxpayer would be about 0.60 DKK/kWh ($0.10/kWh). Buyers of the cooperative's shares can finance 100 of their purchase with a bank loan. The bank considers the shares as collateral. The loan term is a function of the project's payback. A project with a 11 year payback qualifies for a 11-year loan. The bank takes all income until the loan is recovered. As in Germany, payments less any expenses are deposited directly into the bank's account for the loan. An individually-owned wind turbine receives the same payment from the utility, but the revenues are taxable. However, interest on the loan is a deductible business expense. Nielsen says that often a farmer or wealthy individual can finance 100% of the cost. Interest varies over the term of the loan. Rates today are about 9.15%. New projects may qualify for loans at 8%. Shareholders in the single V27 turbine in the Vestas employees' cooperative has a loan at 12.5%. The 225 kW turbine was installed in 1993. Most cooperatives get a contract from the utility for the life of the project or 20 years. However, Vestas employees' cooperative does not have a contract and doesn't seem too worried about it. There are 52 investors in Vestas employees' cooperative, Vestas Mollen I/S. The cooperative bought a 30-year land lease for a 60,000 DKK ($10,000) one-time payment. The farmer who owns the land also bought nine shares. Typically each share in a cooperative is equal to 1,000 kWh/yr. The farmer's shares are equivalent to 9,000 kWh/yr, the average domestic consumption in Denmark plus 50%. About half of the investors obtained a joint bank loan to purchase their shares. The others paid in cash. Nielsen's original cooperative illustrates how the business has changed. She owned shares with 15 others in an early cooperative owning a 55 kW turbine on the island of Foens. The annual shareholder meeting was a picnic. Business decisions were made in the kitchen. But the turbine was hit by lightning and they had to repair or replace it. They received a 275,000 DKK ($45,000) insurance payment that was distributed to shareholders. Many of the older members had invested out of idealism, says Nielsen, and when the cooperative decided to invest in a new 225 kW turbine they opted out. The cooperative then expanded and brought in new members. The turbines have now become so big that they are each capable of generating 1.3 million kWh/yr. A cooperative must then sell 1,300 shares. If each household uses only nine shares, each turbine needs nearly 130 members. 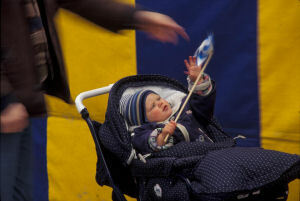 Many families in Denmark's windy regions have already invested in cooperatives. Thus, cooperative developers are finding it difficult to attract new investors. This is the reason behind the Folketing's reconsideration of lifting the tax-exemption limits and loosening the residence requirement. Below is a projected cash flow for an investment in nine shares of a 600 kW wind turbine located on the west coast of the Jutland peninsula. This is a reproduction of a Vestas cash flow statement using a format similar to that used in the Izaak Walton League's guide for landowners. There are some important differences. First, the bank loan is paid off using a "cash neutral" approach instead of equal payments over the loan term. There are no tax credits or depreciation deductions. Until the loan is paid, the value to the investor is solely the value of the interest deduction to a taxpayer in the 50% bracket. Dr. Jensen is a general practitioner in Ringkøbing. He is one of Denmark's few developers of cooperative wind plants. (The other is Jysk Windkraft.) He does so in his spare time and he has profited for doing so. Jensen's interest in wind energy began in 1980 when he and his neighbors began talking about energy prices. Their proximity to Vestas, 10-15 kilometers distant, prompted them to consider installing a wind turbine. They encountered numerous planning obstacles, but after two years installed an early V15 (55 kW) which they connected to the 10 kV line nearby. The results were encouraging so he bought three V17s (75 kW) in 1985. His bank was inexperienced with such investments, but by 1986 he was financing the purchase of two V19s (100 kW) and one V25 (200 kW). He owns these turbines outright. Later, as interest was aroused, he formed a cooperative for installing more turbines on the same site. This took several years to develop. In 1991 the cooperative installed seven V27 (225 kW) turbines. These machines generate about 535,000 kWh/yr, requiring 535 shares per turbine. There are 354 people in the cooperative. Alongside these seven turbines he installed another six V27 for businesses in Ringkøbing. He also installed four turbines for individuals in Ringkøbing. A local bank, Ringkøbing Landbobank (farmers bank) provided financing for those who didn't buy shares outright. Locals have dubbed the bank the "wind" farmer's bank. Revenue from the project goes directly to the bank. The bank deducts 0.04 DKK ($0.0067) per kWh for service and insurance. Another 0.04 DKK per kWh is deducted and placed in bonds with the intent that after 20 years there are sufficient funds for replacing the turbines. This is novel among cooperatives because it considers time beyond the life of the turbines. "In the west country (Jutland), says Jensen, "we have both feet on the ground." These turbines are all on the same site and visible from the town of Ringkøbing. In fact they're visible from many of the rooms of Hotel Fjørd Garden, the most modern hotel in the city. Below is a table summarizing results for 1995. It appears that each cooperative share cost 4,100 DKK. Thus 1995 returned 6.2% before taxes. The after tax return for someone in the 50% tax bracket is 12% and for someone such as Dr. Jensen in the 65% tax bracket, 18%. In a more controversial move, Jensen has begun installation of fifteen V29 (225 kW) turbines near Stauning. The project is controversial on several counts. First, it is near the Stauning airport and this has limited the total height of the turbines to 50 meters. To meet this requirement Jensen is using a smaller turbine than now used in Denmark, the V29, and is installing it on a short tower. The project is also controversial because it is within the viewshed of Taendpibe-Velling Maersk, one of the world's most pleasing wind turbine arrays. BTM's Per Krogsgaard, who is director of the Taendpibe cooperative, publicly opposed the project for its aesthetic impact on Taendpibe-Velling Maersk. Typically a landowner can install a wind turbine for their own use. The turbine must be on their property. Wealthy Danes are installing individual wind turbine at places they own elsewhere in Denmark, when siting rules don't prohibit a wind turbine. In Jensen's project and others installed last year, developers sold 15 meter by 15 meter plots of land to the investor, who then also pays for the wind turbine and its installation. Thus Danes living in Copenhagen, for example, can install a wind turbine on "their land" in Jutland. Each V29 costs 1.9 million DKK ($320,000) each. Normally the investor puts up 20% equity and finances the rest. But Danish banks will provide up to 100% financing by using title to home equity as collateral. Jensen takes out 5-8% ($16-25,000/turbine) as a commission. He believes that 1 million DKK investment in a modern 600 kW turbine at a good site should earn about a 20% return per year. Turbines in the 30 meter size class can earn 15% per year and smaller turbines can yield 13% per year. For example, Jensen's V29s should generate 500,000 kWh/yr. With a payment of 0.57 DKK/kWh, the turbines should generate 285,000 DKK/yr in gross revenues. For an investment of 1.9 million DKK, this is a gross return of 15%. He estimates payback in ten years. Early Danish wind turbines didn't work well and the initial owners banded together to solve common problems. Bjerre and others have been active in the Danish wind turbine owners association ever since. The association has about 10,000 members. Members are individuals, households, or cooperatives. Altogether they represent some 50,000 families or up to 100,000 people. Individuals and wind turbine owners pay 200 DKK/yr ($35/yr). In addition wind turbine owners pay a fee based on the size of their wind turbine. 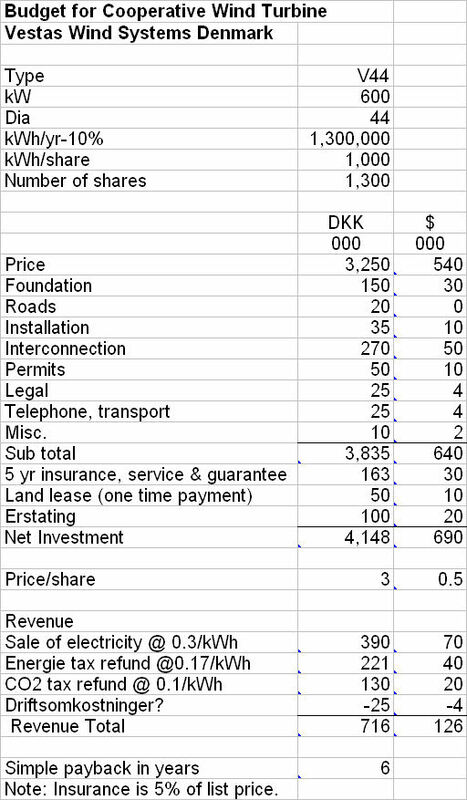 (6) Cooperatives pay 1 DKK per shareholder. Cooperative wind development was a natural outgrowth of Danish cultural and agricultural interests says Bjerre. After the oil embargoes of the 1970s, the Folketing wanted to encourage wind development. The easiest incentive to implement was to exempt wind development income from taxes. (7) It was also the most popular. Though contemporary cooperatives in the windy west of Jutland are performing well, Bjerre says that some of the early ones are not so profitable. In some cases, he says, the shareholders are paying to run the turbines. Bjerre claims that, nationwide, cooperatives are returning about what a deposit in a bank would receive. Though there is far more risk in a cooperative wind project than in a bank deposit, returns from the cooperative are tax exempt. On land leases, the owners association advises cooperatives to make a one-time payment of 100,000-200,000 DKK ($16,000-33,000) for a 20 year lease. They discourage royalty payments and there are very few royalty arrangements in Denmark. Those that exist are 1-3% of revenues. Per is a director and one of the founders of Tændpibe cooperative. He also owns a V23 200 kW turbine that he installed in 1988 at his home. Per's own turbine stands on a lattice tower and qualified for a 15% capital grant. The turbine cost 1 million DKK. Less the 15% grant, he invested 10% and the bank financed the remainder at 10% for 15 years. He financed his 10% investment with a loan at 11% interest for five years. Overall Per believes a better investment was government bonds, which were at the time paying 8-9% interest with no risk. He is receiving only 0.54 DKK/kWh ($0.09/kWh) because his utility is one of the more low cost providers in Denmark. He also discovered that he is physically tied to his investment. He wanted to sell his property but found that potential buyers didn't want his turbine. The permit under which the turbine operates may also not be transferable. "A beach house would have been a better investment," says Per. Per is also one of 480 shareholders in the Tædpibe cooperative. This has been a better investment. The project of 35 V17, 75 kW turbines has produced 10-14% annual return for the past ten years. He stresses that the positive results are in part due to a "very good insurance policy," noting that there have been many claims against the policy. Individually-owned and cooperatively owned wind turbines accounted for two-thirds of Denmark's installed capacity in 1995. However, cooperatives have run out of people in west Jutland. There is ample capital, and ample willingness to invest, but nearly all those who can invest in wind cooperatives have already done so. Sites have also become limited. Per is adamant that the German model is the one to emulate, that is, conclude that wind energy is good for the environment and accordingly pay a fair price for the electricity. The installation of wind turbines falls under normal planning procedures for rural uses, says Per. There is no requirement for an environmental impact study to site a single turbine, a cluster, or even a wind farm. As long as there's no major potential impact. All communes in Denmark must prepare a plan, with extensive public input, on where wind turbines can be sited. Not all have yet complied. The Stromeinspeisungsgesetz (StEG) or electricity in-feeding law was enacted on December 7, 1990. And despite sometimes lucrative incentives from certain Länder, it is the StEG that has spurred feverish German wind development. Like PURPA it guarantees a market by requiring the utilities (EVUs) to take the power, but unlike PURPA it also specifies the payment: 90% of the average national retail rate for solar and wind energy, and 75% of the average national retail rate for hydro power and methane generation. In 1995 utilities paid 0.172 DM/kWh ($0.10/kWh) for wind-generated electricity. Last year the Bundestag passed a new Electricity Feed Law. It took effect this year. The new law has eliminated the uncertainty from utility-sponsored legal challenges. Though there is no legal requirement for a purchase power contract with an EVU, most operators do get a contract of 10-15 pages because it's often required by their local bank. There is no time limit on the length of the contract. Once a turbine is in place, the EVU must buy the electricity indefinitely. The EVUs have begun inserting clauses in their contracts that allow a "regulatory out" if the StEG is changed. This has discouraged some investors and some banks, but has not caused development to grind to a halt. It's seen in political circles as a ham-fisted measure to discourage competition from wind development. Niedersachsen was the first land or state in Germany to offer incentives for wind development. From 1987 through January 1995 Niedersachsen provided capital subsidies of as much as 50%. These subsides eventually declined to 5% before they were discontinued. The subsidies were removed in part because they were no longer needed and because they feared "Potemkin" wind turbines like those seen in California during the 1980s wind rush. Kottkamp is responsible for determining where Niedersachsen will put the 1,000 MW of wind plant it has set as its target for the year 2005. The German Wind Energy Institute (DEWI) has found sites for 1,300 MW in coastal counties after environmental exclusions. DEWI has found additional sites in the interior for another 700 MW. This is sufficient to meet the goal of 2000 MW by the year 2010. But this is all, says Kottkamp, that Niedersachsen will be able to develop because of siting conflicts. Niedersachsen, says Kottkamp, has directed each kreis or county to determine how it will implement the land's objective. Some have opted for distributed turbines. But some local planners, after seeing the proliferation of single turbines, have adopted the wind farm model. Germany is densely populated and has a highly developed sensitivity to environmental issues, says Kottkamp. This makes siting multi-turbine projects extremely difficult and he doesn't envision any projects greater than 50 turbines anywhere in Niedersachsen. Landkreis Aurich, for example, has limited the size of wind plants to a maximum of 18 turbines. Kottkamp, like ISET's Michael Durstewitz and Martin Hoppe-Kilpper, believes that "berger" or citizen-owned wind plants are more acceptable to neighboring communities. Nearly every farmer on the island of Fehmarn has a share in one or more of the island's 100 turbines. It was the popularity of Germany's initial 100 MW program that convinced political leaders from northern rural provinces that wind energy could be a boon for farmers. These politicians count farmers as an important part of their constituency. They joined forces with a member from the ruling party of Bayern, the CSA, who had his own hydro plant. This group envisioned an electricity in-feed law that would pump revenues into the hands of rural landowners. The CSA along with Kohl's CDU held power in the Bundestag. This was the critical combination that moved the StEG through parliament. Hoppe-Kilpper says that Germany has a long tradition of supporting environmental causes and through the StEG the Bundestag could show that they were supportive of renewable energy. Many who voted for it, says Hoppe-Kilpper, may not have thought it would ever amount to much. "Its (the StEG) success has surprised even us Germans." As agriculture restructures in Germany, farmers have to decide whether to invest in a new barn or into wind energy and many are chosing wind energy, he says. Farmers proved to the banks that it was possible to safely finance wind turbines. The rapid growth of wind energy in Germany would not have been possible if the farmers had not paved the way with the banks, says Hoppe-Kilpper. To get a loan in the early days they needed collateral and the farmers had their land. Today dentists and lawyers from the south are installing their turbines in the north and merely renting the land from the farmers. Neighboring farmers get none of the project's benefits yet must live with its impacts. This form of development is creating friction. The DtA loans money to local banks at less than the market rate for loans to enterprises meeting the Ausgleichsbank's objectives. The bank has a division for financing environmental protection projects, including wind energy. From 75% to 80% of all wind turbines installed in Germany have used DtA financing. DtA estimates that by the end of 1996 it will have loaned nearly 2 billion DM ($1.2 billion) to local banks for wind turbine financing since 1991. Local banks provide the initiative. The loan must meet all requirements of the local bank and the local bank is responsible for repaying the DtA. Any losses must be borne by the local bank. Commerzbank, one of Germany's top three banks, was the first to finance wind turbines. Commerzbank uses its financing of wind turbines prominently in its advertising, possibly to solicit "green" customers. Under the European Recovery Program (ERP), wind projects can receive financing for up to 50% of total installed costs at 1.5-2% below the market rate (now about 6% in the west and 5.5% in the east or former DDR) for ten years. Under DtA's environmental protection program, wind projects can receive financing for up to 25% for 5.5% nominal (6.18% real) for the first ten years and 5.75% nominal (+6% real) for the second ten years. (9) Interest payments can be deferred the first two years in the west, and the first five years in the east. Individuals can finance 80% of the total installed cost for 6% over ten years through DtA and their local bank. Wind power plants require more equity, but can still finance 70% of the project's cost. Banks are now willing to finance wind plants at 6-7% for 12 years. To qualify for the loan, the project must have a contract with the utility, a contract for maintenance, and a contract for full insurance coverage. If a farmer in a single turbine project doesn't have the equity needed, he can put up a portion of his farm as security. To qualify for DtA financing, a farmer, for example, creates a new legal entity or business. This business has a separate account at the local bank. The utility issues payments to the business's account at the local. The local bank withdraws its loan payment from this account. The new business can take several legal forms: GmbH, a limited liability company; or GmbR, a simpler form of incorporation. There are numerous other possibilities under German law, but these two predominate. Wind plants pay 5-7% of total generation for royalties on land rental, though this is not universal. In some districts of Schleswig-Holstein, the local kreis requires a payment of a landscape impact fee of 100 DM/kW ($60/kW). In others the local Bauamt or building permit office requires off-site mitigation of impacts. In one project in Niedersachsen, the operator was required to pay 800 DM/ha/yr ($500/ha/yr) for a 25 ha site. The money is used to rent land off-site, which is then flooded in the spring for bird habitat. Udenhausen-Mariendorf is a cluster of five Vestas V44s on 53 meter tall towers. This cluster is one of two clusters of five turbines each just northeast of the central German city of Kassel. The turbines are located in the mittlegebirge, or middle mountains in Germany's central highlands. Ridgetops in the region are wooded and often publicly protected forests or open space. The turbines themselves are on an intermediate ridge within a broad valley bounded by the higher mittlegebirge. The site has an annual average wind speed of 5 m/s at 15 meters or about 6 m/s at hub height. Michael Durstewitz, one of the founding members of the cooperative of 65 shareholders, estimates that each turbine will generate about 1 million kWh annually. Vestas estimates substantially more, but Durstewitz, who works at ISET and has access to data from 1,500 wind turbines in Germany, is more cautious. The cooperative's financial projections are based on his estimates. Dedication of Udenhausen-Mariendorf was a celebration of life with all ages and plenty of beer, würst, and music. Windenergiepark Udenhausen-Mariendorf is a beautifully completed project in midst of a rapeseed field. Transformers are housed in a compact, low-profile, attractive prefab container and all lines are buried--even the line to the 20 kV interconnection 2.5 kilometers away. The interconnection cost 250,000 DM ($150,000). Durstewitz says this is typical for a project of this size: a buried 20 kV line costs about 100 DM/meter ($60/meter or $20/foot). Durstewitz estimates that the project has an 8 year payback, including the first two years when debt service is not required for a project of this type. Land for the project was bought from the farmer. Shares of the project were sold for 2,500 DM each ($1,500). The share price was kept low so more local people could participate. Durstewitz feels that the number of shareholders is a manageable size. Most of the investors live in the surrounding villages, though some live in Kassel, the nearest urban center (200,000 inhabitants). Shares provided 30% of the total investment. DtA, through the local bank (Raiffeisenbank Reinhardswald e.G), provided a loan for 45%. And the state of Hesse provided a 25% capital investment subsidy. Unlike other similar projects, the wind plant owns the land on which the turbines stand. They do not rent the land. About 10-15% of the 250 MW in wind capacity in the Netherlands is operated by cooperatives. Many of the first turbines were installed by coops. Unlike Denmark, where there is an incentive targeted specifically at cooperative ownership, there are no incentives for wind cooperatives in the Netherlands. Kennemerwind was not the first wind cooperative in the Netherlands, but is one of the largest in number of members. (Several members of the Dutch wind fraternity own shares, including ECN's renewables director Jos Beurskens.) They operate ten turbines altogether, nine of which are part of a group of 15 turbines along a canal in Noord Holland. The cooperative is somewhat atypical in that the nine turbines are in a wind plant originally built by the utility PEN, now Energie Noord West (ENW). Kennemerwind is typical of Dutch cooperatives in that the driving force behind the cooperative is idealism, monetary returns are secondary. Nevertheless, since 1990 Kennemerwind has paid a dividend of 7% to shareholders. Among the 500 members, the average investment is 100 NLG ($60), though some have invested 20-30,000 NLG ($12-18,000). The cooperative issues a certificate for "Schone Stroom" or clean electricity to its members as a form of contract and has an annual meeting, but otherwise it's legal commitment to members is unsophisticated. Though Kennemerwind began in 1987, the coop's officers are only now discussing how to better formalize the coop's relation to its members. Members can't "leave" the coop, but they can sell their shares or "loan" agreement. Like cooperatives in Denmark, Kennemerwind (the legal entity) has no bank loans. It raises all of its capital from members. Kennemerwind considers members' investment as a 15-year loan which is to be repaid with interest. Members can reinvest their dividends (interest payments) and nearly all do. They did consider a bank loan to buy one more turbine, but the bank wanted all the existing turbines as security. This was unworkable because the land on which their turbines sit is owned by the utility. Dutch banks, however, are now looking for "green" projects to invest their "Groene Fonds." Kennemerwind depreciates the turbines over four years. However, now depreciation can be taken by investors when they want in the amount they want as a result of the recently enacted Green law. There's no sinking fund for eventual replacement of the turbines. The cooperative is only now considering this question. Antoine Curver, the cooperative's financial officer, says that during the first 5-6 years of the coop, returns were about 28% due in part to a Dutch capital subsidy of 35%. The coops last two turbines, which were recently installed, were bought without any capital subsidy. The returns were high because all work was performed by coop members at no cost. There is no paid staff. However, this may change as members are loosing interest and the work load (for expansion of the cooperative) is increasing. Farmers have installed a significant number of individual turbines, mostly Lagerwey's 80 kW machine. Even though there are some 250 of these machines in the Netherlands, their small capacity, contributes only about 20 MW. Farmers are more interested in installing their own turbines than in leasing their land to cooperatives because their profits will be greater. Cooperatives don't pay VAT (Value Added Tax, a significant tax in every European country) because they are considered resellers and not end users of the electricity. Farmers don't have to pay VAT either, because the electricity is used in their business, that is, farming. This is not considered an incentive, merely removal of a potential barrier. The tax rate on corporations, including coops, is 40%. Because of the new Green law, new renewable energy projects don't have to pay tax on dividends. The normal tax on dividends is 50%. This is a significant incentive today, but it was not available when Kennemerwind and other cooperatives installed their turbines. Kennemerwind has a contract with Energie Noord West (formerly PEN) for ten years. This includes a guaranteed tariff of 0.125 NLG/kWh ($0.075/kWh) plus 0.025 NLG/kWh ($0.015/kWh) tariff that depends on the price of fossil fuel. Kennemerwind paid 200,000 NLG ($120,000) for an 18 meter, 80 kW Lagerwey. They say they have maintained 100% availability on their Lagerwey turbines. The coop has third party liability insurance, and insurance for lost production if the turbine isn't working for reasons other than lightning. They have no lightning insurance. The utility, which originally owned most of the turbines and which still owns the land on which the turbines stand, was previously helpful. This attitude has changed since the government began its new "Groene Fond" program. The utility is obligated by the "Milieu Aktie Plan" for the reduction of global warming gases to install a certain number of megawatts of wind. Initially the utility used Kennemerwind to help it toward this goal. But the utility is now eying the 0.03 NLG/kWh that it passes along to private producers of wind energy and is considering its own projects so it can pocket the money itself. 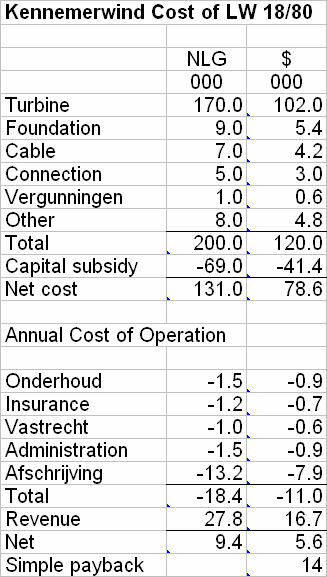 This is the reason why Energie Noord West invested in the farm of Nood de Schutter (see below). Kennemerwind recently began publishing a small monthly newsletter "Westerwind," which reports on production, revenues, and other topics. Noud de Schutter's Lagerwey in the Wierengemeer polder. Noud de Schutter is president of Vereniging Windenergie Noord Holland (the wind turbine owners association of North Holland) and a farmer with 40 hectares (about 100 acres) of tilled crops (all 4 meters below sea level). The de Schutter farm is in the northeast corner of the province of Noord Holland near the IJsselmeer. The farm's principle source of income is from rental of cold storage space to neighboring farmers. Noud de Schutter was a pioneer of cold storage of farm crops in Noord Holland. He is also a pioneer in wind energy "farming." He installed an 18 meter, 80 kW Lagerwey in 1992. (Many other farmers in the Wieringemeer polder also operate Lagerwey turbines.) The turbine stands within 2 meters of one of de Schutter's barns and looms over the central farmyard. This one machine generates 200,000 kWh per year nearly matching the farms annual consumption. (There is some surplus generation in the winter, and a small deficit in the summer.) The Lagerwey turbine has failed once, throwing a blade onto the nearby farm road and topping into the farmyard. The control panel, inverter, and interconnection are all in the utility room adjoining the house. (This is a traditional Noord Holland farm building where half or 3/4 of the building is a barn, the remainder is the living area. The entrance to the living area passes through the utility room where the turbine's controls are located.) De Schutter also owns another 80 kW Lagerwey in a cooperative. De Schutter also now owns a 1/4 interest in five 600 kW Micon wind turbines in a string along a canal at the border of his property. His neighbor owns another 1/4 interest as does Micon, the manufacturer, and the local utility, ENW. The turbines were recently installed and the project is viewed as a possible model for future projects in Noord Holland and elsewhere in the Netherlands. De Schutter and other farmers pay 0.18 NLG/kWh ($0.108/kWh) to purchase electricity. ENW pays de Schutter 0.15 NLG/kWh ($0.08/kWh) for excess generation from his Lagerwey. When he installed the Lagerwey, de Schutter received a 35% capital subsidy. He had no problems with interconnection. The project qualified for a 35% capital subsidy for installation in January 1996 (this program expired at the end of 1995) and will generate 6 million kWh annually. 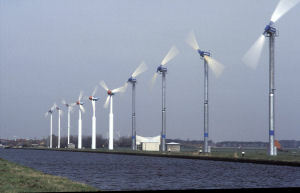 Micon turbines on the property line of Noud de Schutter's farm in the Wierengemeer polder north of Amsterdam. NedWind two blade turbines offshore in the background. The owners provided only 20% of the equity, which was more than recouped immediately with the capital subsidy. The bank uses the turbines as collateral (project financing), but does require title to the land lease and utility contract should the company fail. The farmers lease the land that the turbines stand on to the project and are paid accordingly. This was the first project financed by Groene Fonds in the Netherlands. Rabobank provided 10-year financing at 4.9%. The utility spent 2 million NLG ($1.2 million) on line improvements, but the project only paid part of the costs. (No doubt because the utility was a partner in the project!) The utility, ENW, not surprisingly said most of the infrastructure expenditure provided system wide benefits. The road to the six Micon turbines was unbarred, and unfenced. Europe's largest wind plant contains 94 Kenetech 33 MVS turbines near Eemshaven northeast of Groningen. Though EDON has installed several dozen Lagerwey 80 kW turbines individually at pumping plants throughout Groningen province, the distribution utility has aggressively attacked distributed generation as "too costly." At the dedication of it's Eemsmond wind plant it publicly attacked PAWEX (the spokesman for PAWEX was in the audience) for its demands, saying EDON developed Eemsmond for only 0.105 NLG/kWh ($0.061/kWh) and will do it for less in the future. EDON's chief executive, C. Witvliet, said that large, utility-owned wind projects are the only way to "spread the use of wind energy at the lowest cost." In light of Kenetech's technical failures and bankruptcy, it will be interesting to see if EDON meets its cost targets for the Eemsmond project. 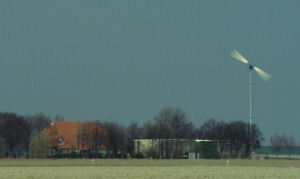 Two days before the dedication of the Eemsmond wind plant on May 30, 1996 one of the new Kenetech turbines threw a blade. Though Kenetech recommended shutting down all the turbines as a precaution, the embarrassed utility ordered the broken blade replaced and all the turbines kept in service for the dedication. Fortunately, there was no wind on the day of the dedication. Since 1996 the project has been plagued with technical problems and all the blades have been replaced. The turbines and their towers are among the ugliest in the world and they were installed on ugly concrete foundation extenders. Unlike the nearby row of Micon turbines, which were installed first, the Kenetech turbines spin counter-clockwise (no doubt to "distinguish" themselves in the "marketplace"). This produces a jarring effect to the eye when approaching Eemsmond. 1. There is also a strong cultural affinity for cooperative or joint problem solving in Denmark. For a lucid account of this and an insightful description of Danish culture see Steven M. Borish, The Land of the Living: The Danish folk high schools and Denmark's non-violent path to modernization, Blue Dolphin Publishing, Nevada City CA, 1991, 488 pp. Borish is an anthropologist who studied several Danish folk high schools, one of which he selected because it held a course on wind energy. 2. This was intended to thwart investors in Copenhagen owning wind turbines in Jutland. Despite its small size (about that of Indiana) there are strong regional identities in Denmark. People living in Copenhagen even speak a different dialect than those in Jutland. 3. The retail price of electricity in Denmark has been declining for several years as the price of coal has declined. The 85% of retail price in 1996 is 0.09 DKK ($0.015) less than the 1994 price. 4. The Danes have probably done more work in this area than anyone else. See "Vindmøller og Landskab: Arkitecktur og Æstetik," Birk Nielsens Tegnestue, Århus, Denmark, 1996, 63 pp. There should be an English translation sometime in late 1996. See "Wind turbines in harmony with the landscape: Records of existing wind turbines and a study of the possibility of replacing them," Møller & Grønborg AS, Løgstør, January 1996, 34 pp. 5. Unlike California limited partnerships, Danish cooperatives or in other forms of partnerships, ownership and responsibility for removal of the turbine is clear when an individual has clear title to the land and turbine. 6. up to 100 kW, 4 DKK/kW; 101-500 kW, 1 DKK/kW; 501-1000 kW, 0.5 DKK/kW. 7. By limiting this exemption to cooperatives of those residing in the area of the wind turbines, they avoided the abuses found in California. 8.I have visited and photographed this site many times. I revisited it on this trip to see for myself the corrosion that so concerned Per. Yes, there is some corrosion showing through the white paint on the towers. But you have to be among the turbines to notice it. This is a vivid example of Danish concern about the "appearance" of their wind turbines as a critical element in the use of wind energy. They would repaint the towers not because they were legally obligated to do so, but because they have a social responsibility to do so. 9. Previously the rate was fixed for 20 years. 11. While an amusing exception to an American. It is of note in the Netherlands. The Wieringermeer was flooded in 1945 when the dike was bombed.